Home » 4th of July » Treasury Tuesday Roundup: Happy 4th of July! Treasury Tuesday Roundup: Happy 4th of July! rethink our concept of who we are. This entry was posted in 4th of July, Etsy, Green Living, Recycled, Summer, Treasury and tagged 4th of july, adaoz, AliferousExpress, America Is Not... Is, Appleandivy, AppleWhite, backporchstudios, bathing suit, BBQ, beach bag, becaruns, Biberklau, BlueBirdLab, BrokenGhostCouture, BucktoothedBunny, bumbleebuck, Buntmal, CatchSomeRaes, chickenandcustard, clothes, craft, CreaShines, decor, DeLaBelle, DestinyPhoebe, dishes, EcoShag, Embroitique, EricaLeaPhotography, etsy, fashion, Febystan, feltjar, flags, FondueAvenue, gardenmis, Gregory Allen Uhan, handmade, handmade in america, handmadewithlove4you, HandPaintedPetals, happyment, helendesign, HerBeautifulLife, HMCreativeSupplies, HoraEffect, houseway, independence day, jewelry, JoozieCotton, JullMade, kikisvintagejewelry, LaurelAndLime, LBCpaper, lostboysandlovers, LulusGalaxy, maldonadojoyas, marbled, MariesMarketplace, meynenz, MissPottery, Modred12, MoonCircus, nbdg, NifticVintage, octopurse, okapiknits, OneMe, oyma, PaintRobot, PannaKotta, party, PeriwinkleNuthatch, poetry, poosac, Raceytay, reclaimed, Recycled, red white blue, reiter8, RueDesLouves, RustBeltThreads, sakao, saltandginger, SassyStitchesbyLori, scarg, SevenTen, sharonclancydesigns, SimoneSutcliffe, sorrythankyou79, SpareTimeWoodDesigns, Sudrishta, sunglasses, Sweetkeetle, SweetPaperLove, thecupcakekid, ThisandThatCrafter, toocutecustomcrafts, tote, treasury, treasury Roundup, tweakedgreen, viruset, wishdaisy, WonderVintageShop, xoUda. Bookmark the permalink. Beautiful Treasuries! Thank you for including mine in your blog! Have a wonderful 4th! You’ve some wonderful picks! Thanks for including one of my items. Your bobby pins are super cute! Fun, fun, fun! Thanks for including my recycled sail pillow. I’ve found some new favorites. Happy 4th! Lovely collections! Thanks so much for the include! Thank you so much! Beautiful treasuries! Gorgeous T’s! Thank you Jessica! So glad I found your blog — it\’s wonderful! Terrific poem, too, and so very true for USA! Thank you for including my shop in your blog — So many terrific goodies in these treasuries! Great collections! Happy 4th of July! This is awesome Jessica! I can’t wait for the festivities to begin! Thanks so much! Beautifully done RED/WHITE/BLUES! Wonderfully patriotic, love the “America Is Not/Is” poem! 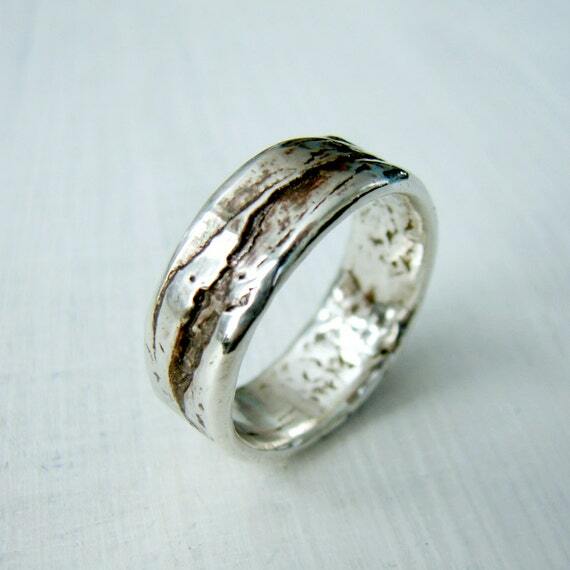 This Birch Bark wedding ring is cast from a real living tree. Welcome to my space, my name is Jessica, I'm a fine Jewelry Artist. I love art, I live for color, and I try to bring good design into every aspect of my life. You'll find a lot of different areas of design here, from jewelry, to textiles, even interiors, and food because everything in life can be done well.